researched and thoroughly fascinating account of the scientific, political, and commercial ramifications following the discovery of a Stone Age man's mummified corpse. 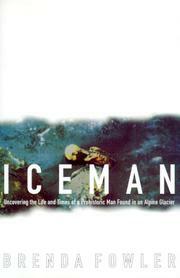 Fowler, a New York Times contributor based in Vienna, covered the discovery in 1991, and in the years following has interviewed dozens of men and women connected with the Iceman. From these interviews and their published writings she has constructed a complex tale of how the widely publicized discovery launched a spate of scientific research and conflicting claims, aroused fierce political and academic rivalries, and became the center of a controversial commercial venture. Her account begins with the body's discovery by two Alpine hikers and its botched recovery from the ice several days later. Since the site was at first assumed to be in Austria, the mummy was taken to the University of Innsbruck, where the head of the university's anatomy department placed it in one of his department's freezers and for the next six-and-a-half years controlled access to it. His goal of preservation ran counter to that of researchers pleading for a piece of the mummy, and his plans to commercialize the Iceman led to restrictive contracts governing publication of research results. Artifacts (weapons, tools, clothing, etc.) found with the Iceman were taken to a museum in Mainz, Germany, and put into the care of skilled archaeologists and paleobotanists eager to reconstruct as much of his world as possible. While the scientists squabbled about access and theories, Austria and the largely autonomous Italian province of South Tyrol (in which the find was soon determined to have been located) bickered over commercial exploitation of the mummy. In the end, commerce won out over science, and today, curious tourists can view the Iceman at South Tyrol's new museum of archaeology, where he has been on display since 1998.